Isobel O'Hare starts her chapbook The Garden Inside Her (Ladybox Books, 2016) with a quote from Penda's Fen, a dreamy TV play by David Rudkin that aired on the BBC in 1974. The play is remembered for its mythical visions and poetic language, which suits this collection of surreal vignettes; much like the images in Penda's Fairy, the poems in this collection twist around each other and touch for only seconds on complicated subjects – sexuality, death, the crevasse between technology and experience – before they drop off at the end of each page. O'Hare quotes, “What is hidden beneath this lovely shell of earth.” Indeed, the poems that follow are grounded in two images that revolve around upheaval and gazing into the earth; the first a cliffside that the narrator is terrified to approach, and the second mossy green vomit, which erupts from the narrator and other characters in the chap like an alien dredged up from the gut. O'Hare focuses in on that image of vomiting more than any other, referring to it often as “the green” or the “green inside me” which transforms the puke into something amorphous, natural, even precious. This green is O'Hare's garden, which disturbs the more mechanical and technological moments in the chapbook the way vegetation reclaims abandoned buildings. In her poems, O'Hare plays with that balance of natural and virtual space, never letting one win over the other. wearing out of my body after so many years. what yes is supposed to feel like. How rare a yes should be. O'Hare talks about her body like a system in this piece – again trying to balance the natural with the technological. Love is a “wearing out of the body” after years of use, as if she were more machine that human, unconsenting, programmed to love because there isn't another choice. She builds on this in the next vignette, which is brief; it reads, “Known as a broom // as a woman. / She who stands in the corner / until she is needed.” Again, the female body is a tool, used for one purpose, ignored when it is no longer needed. This poem solidifies the collection, transforming it into a series of poems not about binary code or love, but about healing. This is the true beauty of O'Hare's work. At the same time that it stirs up difficult feelings of loss, pain, loneliness, and death, it fosters hope. Early in the chapbook, O'Hare repeats the lines, “It rained this morning. Maybe something / will grow in this city; become green.” The Garden Inside Her is a cleansing of the body, an embrace of the violent, wild green inside everyone, a prayer for newness. This book read like a mantra and a journal, an embrace of the difficult and the beautiful, an acknowledgement of the balance that those diametric forces can create together. Rebecca Valley is a poet and freelance writer living in Olympia, WA. Her poems have been featured most recently in the Pickled Body, M Review, and Rattle. She is the poetry editor of the Drowning Gull, and editor-in-chiefof Drizzle Review. You can find her on Twitter at @rebecca_valley, or online at rebeccavalley.com. A couple things about hugs that are worth noting before moving onto the review proper: 1) hugs last as long as either party wants them to (or doesn’t want them to), 2) hugs establish a connection between the body and the mind that precedes any thought on either party’s part, 3) hugs can come at the perfect time. The opening poem “a letter to the Beijing Metro” introduces a key theme used skillfully throughout the chapbook – the connection between the reader (you), the “you” of poetry, and the author/speaker. (The authorial connection to the speaker is a strong point in Taylor’s poetry, and she uses it throughout the chap wonderfully.) Immediately, a spark is created between “you and I and our/ humanity”, creating a pitch that doesn’t let up until after the end of the poem when Taylor has offered a seemingly life-or-death injunction to “say something with meaning!/ say something with longing!” (4). If that wasn’t enough to convince you of her argument, she connects it back to her own experience brilliantly by saying, “I too have that longing/ you know what I speak of.” (4). The poem works better as an introduction to the chapbook than as a standalone poem where it can feel disembodied and a bit pushy, but here it works wonders, ending with the word “yours” to remind you of your human duties to love others (discussed in the first half mostly) and yourself (discussed in the second half mostly). “the oceans are rising” is the perfect second poem to a severely loving and commanding first poem: a lithe and seemingly effortless extended meditation into our birthright to love and be loved and to honor ones parents. (It’s said better than that of course, but you get the idea.) This poem establishes the connection between the affecting and the colloquial that is one of the hallmarks of Taylor’s engaging style. In the first half of the chap, pitch doesn’t matter because the subject matter is at once so engaging and relatable. This has something to do with the way the poems are laid out on the page: a stream of perfectly short or long lines down the page without stanza breaks. Erin Taylor is talking about things of such importance that your silly stanza breaks would only interrupt their urgency and render them meaningless! One of my favorite things about Erin Taylor’s writing is the blending of impermanence and permanence until the terms no longer matter (“we all chose to forget our impermanence/ until we felt solid again.” from “a day before everything got cold”), until the things you thought you knew no longer matter and you are left with the naked fact of existence (“with you”). Although this may strike some as less than liberating, Taylor lifts the nature of this revelation into something a friend would say to you nicely and at the right time, so that the episode you’re experiencing can not only expire quicker but make a more lasting impression (“a friendship in symbols”). The hard-fought lessons in OOOO also eliminate the need for lessons in the first place, something life teaches you but only later, this ultimate lesson coming after a requisite attachment to sitcom finality and immature bow-tied resolution (“I love lucy meets night of the living dead”). This is the after-effects of realizing there is no after, and it’s reassuring to be told this from someone who truly cares. What can be more loving? 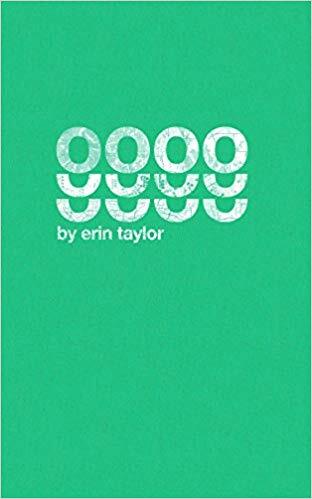 OOOO is now available from Bottlecap Press.